(an old enemy from her Hogwarts school days -both fell in love with a teacher called "Gilderoy"). Well, as you can easily see, something was wrong - maybe there was some frogspawn on the hair???? This is Flitzhinaus, he is a GoldenDesertDragon -baby. He prefers warm temperatures and dry places, is even able to learn human speech (only if he wants to). You will not have seen one before, as they are rare. Really rare, almost eradicated be generations of males as their skin is the only working antidote against male hair loss. 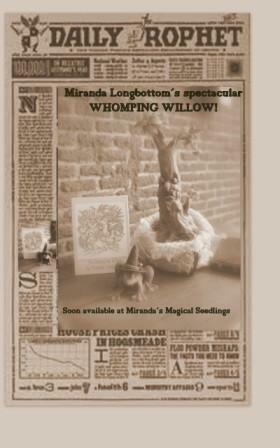 "Miranda´sMagicalSeedlings" are on the first floor, her private rooms will be under the roof. Somehow I am not able to make links today -sorry! Kaisa is organising a Birthday Swap and today is Rosella´s Birthday! Hey, I am really in the mood for springtime! Are you, too??? What a cute and interesting post. I am getting to know Miranda and will follow what she'll be upto. Your gifts to Rosella are wonderful. Miranda's Magical Seedlings is a fabulous idea and I love the witchy things you have been making :0) The pumpkins are amazing!!! que preciosos trabajos, me encanta ese caldero y el dragoncito!! WoW, so much witchy details:smiling pumkins, pots etc!! You've made a lot of miniatures, such beautiful miniatures! Beautiful work. I like the pumpkins. cookbook and.... photo of George!!! Your gift to Rosella is wonderful. Wow your witchy things are amazing. I love the pumpkins and the little dragon. Your stories are great fun looking forward to seeing more. Der Drache ist ja super niedlich. Über die vielen neuen Sachen wird sich Miranda sicherlich sehr freuen. Die Weiden sind der Hammer, die sind so cool mit dem Gesicht. Und Rosellas Geschenk hast du super gemacht. Das gefällt nicht nur Rosella. Heute waren ja schon richtige + Grade. Na klar hoffen wir alle auf den Frühling nach der großen Kälte. You are really into your witchy world at the moment! The baby GoldenDesertDragaon is just too cute! Your flowers are lovely as always and very spring like. I love your gifts to Rosella, sadly she is still waiting for the postman as some gifts have not yet arrived, including mine.